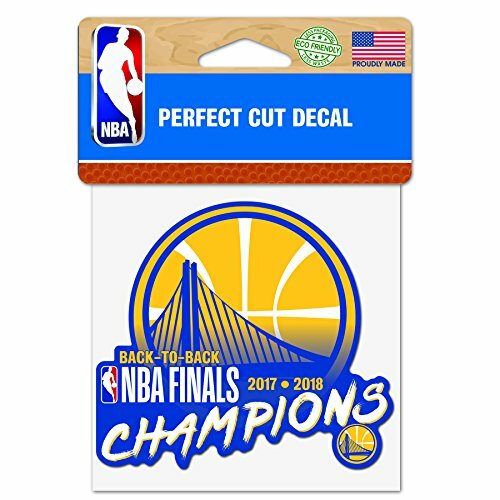 Top Quality Team Colors 2018 NBA Finals Champions WinCraft Vinyl Perfect Cut Decal. Displayed on the Front is a 2018 NBA Finals Champions Logo, Golden State Warriors Team Logo, & the Print "Back-to-Back." Perfect Cut decals are made of outdoor vinyl and permanent adhesive. The full color detailed image is cut to the outside dimension of the logo with a 3 year outdoor rating. Supplied with a clear liner, transfer tape, and application instructions. WinCraft NBA Houston Rockets 48692011 Perfect Cut Decal (Set of 2), 4" x 4"
NBA Denver Nuggets WCR66683091 Round Vinyl Decal, 3" x 3"
WinCraft NBA Utah Jazz WCR29772010 Perfect Cut Decals, 8" x 8"